After receiving several major updates, including a completely new transmission, Deutz-Fahr launched its RC-Shift 6 Series tractor. Richard Bradley put the latest machine to the test. 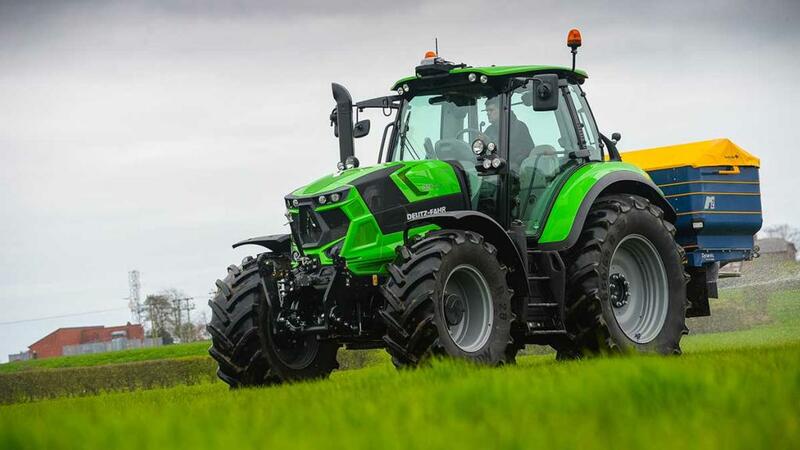 Along with its Stage 4 engine, Deutz-Fahr’s 6 Series features several major updates. 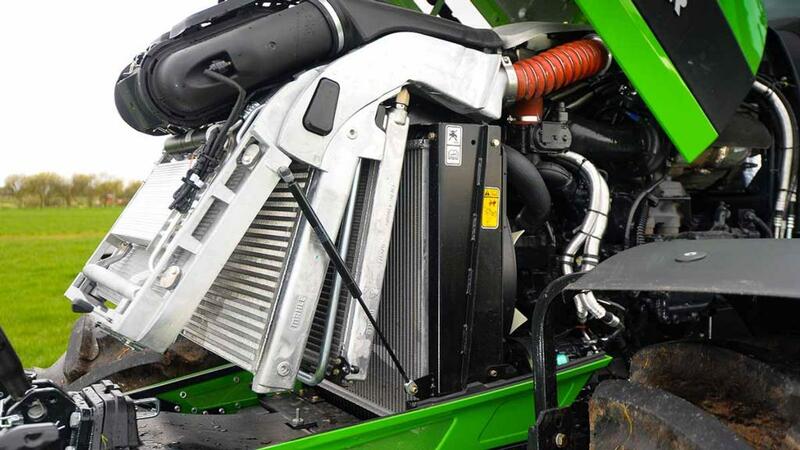 While Stage 4 engine emission compliance was one of the drivers for Deutz-Fahr to update its six-cylinder 150-220hp 6 Series tractor range, the firm also saw fit to incorporate several major updates. One of the biggest changes is a newly developed semi-powershift transmission from ZF, featuring more speeds than the existing gearbox, but using fewer ranges. Filtering down from the firm’s larger tractor ranges, the latest 6 Series features more aggressive styling, a revised cab frame and front axle suspension system. While a lower spec’d manually shifted PS model is available, along with the firm’s higher spec continuously variable transmission TTV range, we put a top-spec 6185 RC-Shift through its paces on a mix of transport, muck spreading and fertiliser application duties. Under the 6185’s aggressive bonnet is a 6.1-litre, six-cylinder Deutz engine, which pumps out 185hp from the second the key is turned. To meet Stage 4 engine emissions, a diesel particulate filter is now fitted, along with selective catalytic reduction using diesel exhaust fluid, a diesel oxidation catalyst and exhaust gas recirculation. Access under the bonnet to radiators, which feature an aluminium construction and hinge open wide with one latch, and all filters and fillers is good and can be done down one side of the engine. However, the bonnet is heavy to open and needs a large flat screwdriver or coin to turn the latch. Access to the engine is good, and radiators easily hinge open for easy cleaning access. Working on some soft ground with a 12-tonne rear-discharge muck spreader, the 6185’s engine held on down to a torquey 1,400 revs. Providing six speeds in each of the five ranges (three speeds in reverse), the newly developed ZF RC-Shift transmission performs range changes robotically. A creeper speed is also fitted, which takes the transmission up to 54/27 speeds. Operating the transmission can be done in four modes: manual; semi-auto; auto field; and auto road. Modes can be quickly changed via a button on the armrest when entering/exiting a field, for example, but the button would benefit from being moved from underneath the armrest to a more convenient location. Manual mode requires changing of speeds and ranges through the armrest-mounted controller by pushing forwards/backwards, with range changes needing a consent button to be held. Semi-auto mode changes speeds automatically, and range changes as with manual mode. Both full-auto modes change ranges and speeds. Without the optional iMonitor touch screen terminal, transmission and hydraulic setup is taken care of via the colour LCD dash. Start-up, maximum and minimum gears can be set for the three auto modes, with a simple dial to set whether changes should be made for maximum power or economy. While auto-road mode provides silky smooth speed changes, we found semi-auto the most useful when fully laden on the road, as it prevented range changes at inappropriate times. 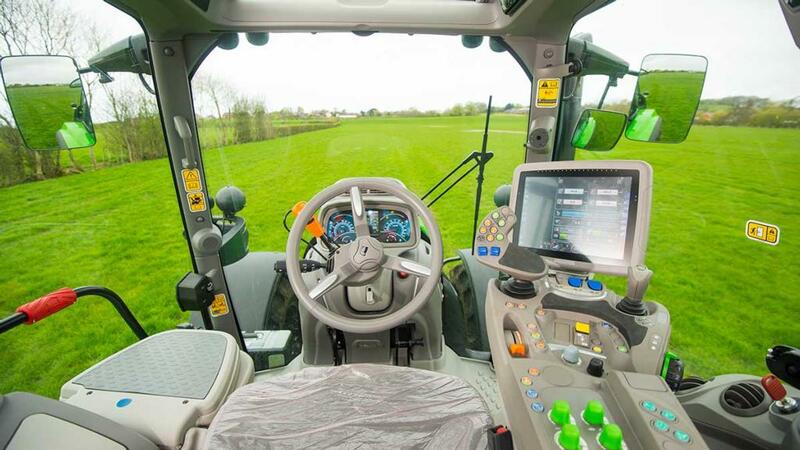 Three auto modes also allow the tractor to be held on the brake pedal without the clutch, which is very useful when pulling away from junctions and out of field gateways. When shod on 42in rims, the 6185 can achieve 50kph (31mph) in its top three gears, meaning an economical 1,400rpm in the highest gear. 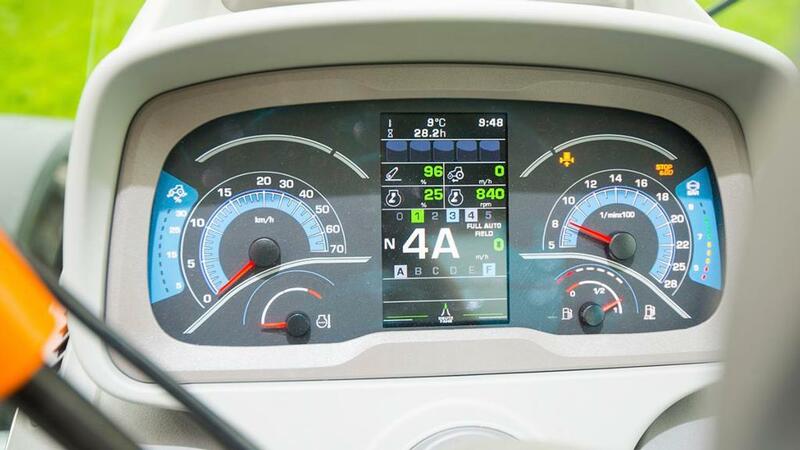 In-cab, two engine speed memories can be set, as can a speed memory – useful when on the road, as you simply press the button and it will smoothly take you to your top speed. Differential lock and four-wheel drive can be engaged manually, or an automatic mode can be switched on, with speed and turning angle parameters set to activate and de-activate them. Taken from the firm’s TTV 6 Series tractors, the RC-Shift features a new cab frame which allows Deutz-Fahr’s Agrosky system to be fitted. Optional 12-inch iMonitor is clear and simple to use. 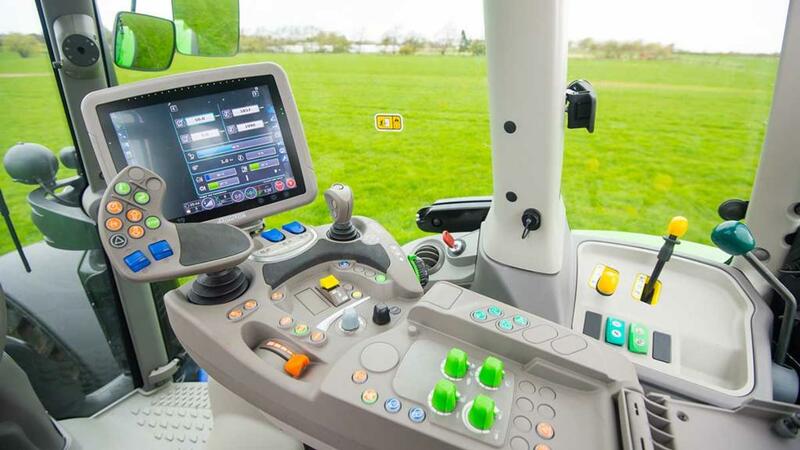 Based on Topcon’s X30 touchscreen display, the optional 12-inch iMonitor is able to run variable application rate, section control, automated steering and IsoBus applications, as well as setup all tractor functions. 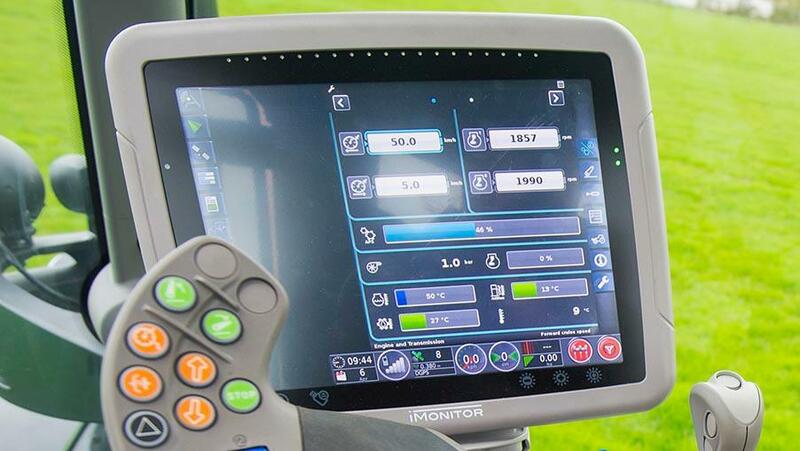 While most of the tractor’s information and settings can be accessed through the dashboard’s LCD display, the larger screen allows more convenient adjustment of settings, such as spool configurations, engine speed memories and transmission settings. Similarly, setting up automated steering is quick and simple. Access into the cab is good thanks to a wide opening door and shallow wide steps. A light fitted to the mirror arm illuminates the steps and turns on when the door is opened; a button on the steps allows this to be turned on manually, with a similar light overlooking the rear linkage for coupling/uncoupling. Views out of the cab are good, however, access requires some obstacle avoidance. Right-hand door is now only an emergency escape. When exiting the cab, however, you find the steering column could benefit from being able to tilt further upwards and you may have to keep your head clear of the left-hand mirror. On the whole, views out of the cab are good and there are plenty of well-sized storage compartments, including a large chilled bottle holder. Keeping air moving, 14 air vents are dotted around the cab and rear quarter windows can be opened to allow fresh air in. While the armrest can be easily moved forwards and backwards, the air-suspended operator’s seat does not feature any swivel. Despite a few niggles, controls are well laid out, and the multi-controller falls easily to hand. Control-wise, two hydraulic spools, headland management, linkage raise and lower, speed memory, forward/reverse and a de-clutch button are all incorporated into the multicontroller. While a transmission neutral button is mounted nearby, it would be more convenient on the controller itself. Similarly, a button to engage autosteer on or close to the controller would be a handy feature, but you can incorporate this into a headland management sequence. All lighting controls are conveniently clustered on the B-pillar, and when the sidelights are turned on, all controls and buttons are effectively backlit. At the rear, four proportional electronic spools and power-beyond are standard fitment, offering 120 litres/minute oil flow, with the option of a further spool and a 160 litres/min oil pump. A light overlooking the rear is very handy when hitching up in the dark. Air over hydraulic brakes are also standard fitment, however, the hydraulic brake coupling is inconveniently located in-between the top link and spool block. Unfortunately, at the backend there is no integrated spool for the hydraulic pick-up hitch. While a sightglass is fitted to quickly check the transmission oil level, the filler is mounted high above the couplers. Thanks to a beefed up backend on the top four models in the range, these can be fitted with up to 42in rims. The rear axle also features thicker wet disc brakes. Re-designed front suspension provides a smooth ride along farm-spec tracks. Up-front, a new suspension linkage has been fitted which now sees the two rams mounted forward of the axle. The suspension does a good job of preventing front-end nodding when changing up/down gears, and coupled with the cab suspension, irons out bumps from farm-spec tracks. 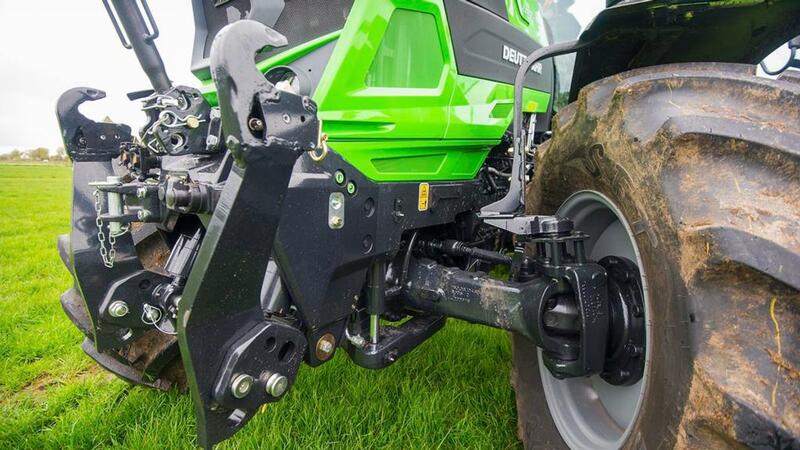 Available as an option, the factory fit front linkage can lift up to 5,500kg, thanks to a Dana front-axle which is fitted to the three largest tractors in the range. 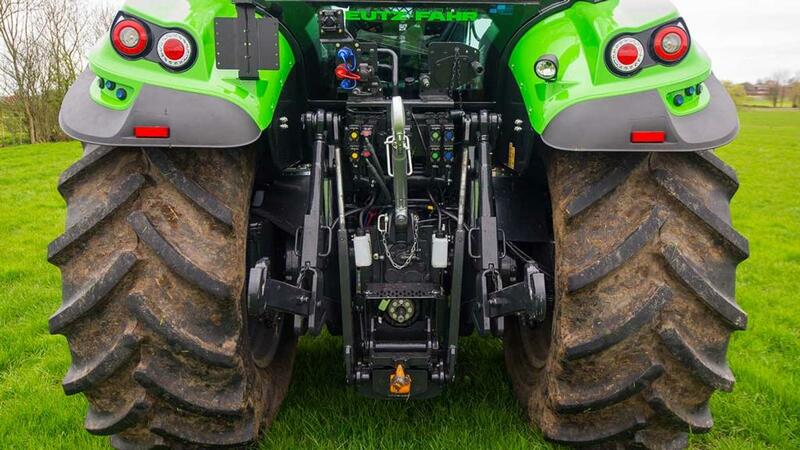 The front linkage features external controls, with rear mudguards also receiving controls for linkage, pto and one spool. Implement drive comes through a four-speed rear pto and optional front pto. Unfortunately, for such a high-spec tractor, the RC-Shift does not feature electronic pto speed selection. 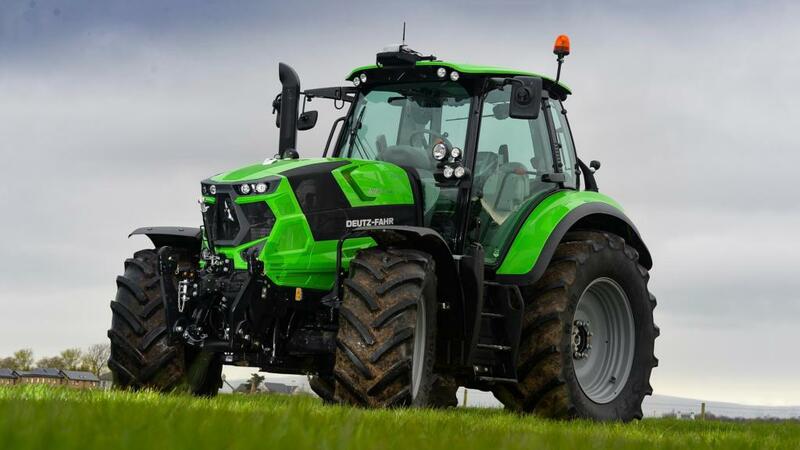 With some major changes and revisions, Deutz-Fahr has been busy with its latest 6-Series. Among a whole host of tweaks to range, the new ZF transmission is silky smooth at changing between speeds and, while there is a noticeable pause during range changes, it is no different to the time for an operator to change a range manually. Thanks to its relatively compact size and constant power, the 6185 was equally happy dragging an 18-tonne trailer and spreading muck as it was treading lightly on tender ground to spread fertiliser. Overall, the 6185 is an impressive machine, but it is more of an operator’s machine rather than a simple jump on and drive tractor. While it takes a little getting used to, the 6185 RC-Shift is packed with some smart features.